Lazy Rivers are a feature that has been very popular at resorts and theme parks for many years. But until recently, a trip to those crowded public venues was the only way to relax on a raft or hang in an inner tube as the gently rolling water pushed you along. The concept was relaxing but the actual process was more like being stuck on a conveyor belt with a few thousand other people in search of a bit of tranquility that didn’t exist. But UNIQUE Custom Pools is able to offer you not only the relaxing concept of floating along a Lazy River with a cold drink and a smile but they are also able to bring that dream to a reality; right in your own backyard. The secret to a successful Lazy River project is a commercial quality pump that is designed to constantly be moving an incredible amount of water. When thinking of the average residential pool, 12’ x 24’ and 5’ deep, that pool has a capacity of about 10,000 gallons of water. Now picture adding in a Lazy River which is 10’ wide and 120’ long and also 5’ deep. That adds roughly another 50,000 gallons of water. So we have 60,000 gallons of water that we want to continue to move enough to create the meandering motion of a Lazy River. The math is going to quickly get complex but you can be pretty certain that you want to float faster than the water moves in your pool when the cleaning system is running. So with 6 times the water you are looking at a pump that is more than 6 times bigger than your 1 horsepower cleaning pump. Now you have entered the realm of the commercial quality Riverflow Pump which can move upwards of 2450 gallons per minute with the 10 HP model. Beyond all of the technical math and engineering that Chris Griffin loves and could explain to you in extreme detail, there are a great many benefits to this system that those who are not gifted at math can still appreciate and really use. First is the 5 year warranty. That is not to say that you need to be worried about your pump failing. But in the rare event that it does, then you have a reputable manufacturer who is going to get it repaired for you… for free. And knowing that no business wants to give anything away for free, you should understand that Riverflow is pretty certain that their quality will not let you down. Another great feature in addition to the quality is the low maintenance required by this pump. Less maintenance means more time for you to actually enjoy floating around your Lazy River with a cold drink in hand and nothing but relaxation on your mind. In addition, this pump offers a programmable timer so you can let the UNIQUE team set up a program for you and then forget it. No need to be learning a bunch of complex commands and settings to make your Lazy River function. And finally, all of the added bells and whistles that make this pump the best selection such as electronic variable speed control, ultrahigh flow rate, low operating cost, single and three phase capability and the added bonus of extremely quiet operation. Decide you are tired of feeling like a salmon swimming upstream when you go to the resort Lazy River. 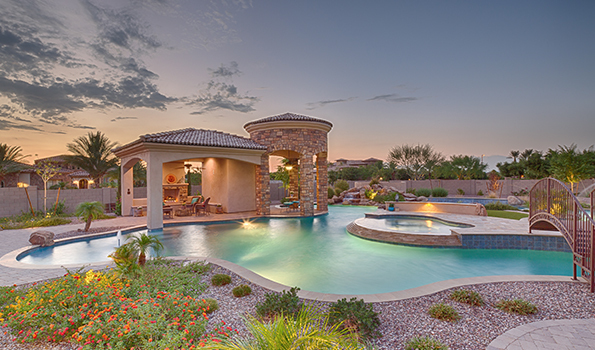 Do your research to learn that UNIQUE Custom Pools is the leader in custom pool and Lazy River design and construction in Phoenix. Call Chris Griffin and the UNIQUE design team to help you create your UNIQUE and private Lazy River. Once you have taken those three simple steps, then your work is done. Now the UNIQUE team takes over to handle every aspect of the design, engineering and construction your personal Lazy River water feature. And if you are reading this then you are already on step 2 so all you need to do is make that quick call to 480-969-1911 or send an email and you are on your way to the Lazy River of your dreams.